Want get all the Krishna Conscious news delivered to your device? There are many great reader apps such as Feedly.com. With these apps reading articles is a breeze. In Feedly and other reader apps articles that have been read are removed from the list and those articles that do not interest you can easily be discarded. All you need to get started is just to get the RSS link. Go to the top left of our website and right click “Entries RSS” and then click copy link address, as seen below. 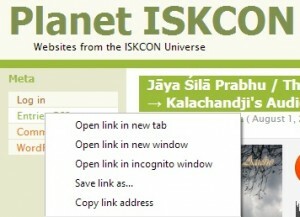 Enter that link address by pasting (ctrl + V) into your reader app of choice.